At times the music of Israel Nash Gripka is reminiscent of Neil young, not just in terms of vocal similarities, but also the huge scope and completely individual quality and style. That music has a lot of country in it but is not really country music. There is a persistent almost anthemic ‘high lonesomeness’ to every song and yet whilst the album can be played quietly, thanks to the often slow moody feel, from personal experience I know that he and his band can also play this music incredibly loud in a live setting without ever losing any of the subtleties. Every song has a strangely epic nature, not necessarily lyrically, but thanks to the often dense at times almost overwhelming musicality. In some ways there is an occasional ‘prog rock’ feel, but don’t worry this album is definitely rooted in country music, it’s just the musical meanderings that rise and fall in texture that leads to the ‘prog’ feeling. There is an ethereal quality to most of the songs on this album of incredible soundscapes that he paints with his intense lyrics and haunting music. Even if you don’t understand all of his lyrics you just know this is an unusual and charismatic lyricist and musician of great talent who just goes his own sweet, completely individual stylistic way. 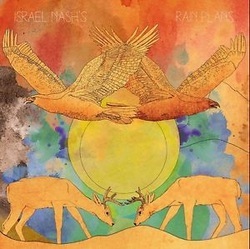 Overall these incredible musical soundscapes are a reflection of Israel’s new home outside Austin, Texas, deep in the huge dramatic open spaces of the ‘hill country,’ making it easier to relate to his inspiration. On this album Israel is supported by his excellent band of talented musicians who are obviously sympathetic to each songs requirements. They are Joey McCllelan on guitars, Eric Swanson plays pedal steel guitar, Aaron McCllelan on bass and John Fleischman on drums with Israel having written all nine of the songs and produced the album. There is a haunting intensity on which everyone plays their part without any instrumental pyrotechnics, just great playing that gets the absolute best out of every song. This album is texturally different to it’s excellent predecessors, exploring his musical development with these soundscapes that whilst often containing a slow moody mellowness, conversely also includes a brooding, intensity that keeps the listener slightly off guard, something that only the best musicians can achieve, in many ways exploring the myriad sensations that we are all beset by, often all at the same time. The album opens with Woman At The Wall, a haunting echoing tale of stunning beauty with his vocals often sounding like Neil Young, not a bad comparison because Gripka is very much his own man musically, wandering wherever his muse takes him on this gorgeous, dense ballad that has such a powerful, uplifting ebb and flow. Next is Through The Door, probably more of a country song thanks to the steel guitar lead and excellent acoustic guitar accompaniment but again the song has a haunting air to it that in many ways defies categorization, but one that contains an intensity that slowly builds. There is more haunting steel guitar on Just Like Water with Israel’s lead vocal having a loose almost ethereal feel, as do the harmonies, with the sparse haunting wash of instrumentation adding to the smooth haunting texture. Iron Of The Mountain is a quite stunning song that starts with a nice acoustic guitar before the wash of sound gradually creeps in and envelops the tale, joined by the haunting almost choral vocals on an epic rural tale. Finally, Mansions contains some tremendous lead guitar playing that wakes up the slow moody mellow feel of the song eventually building to a crescendo on a tale that is reminiscent of Cowgirl In The Sand but without really being anything like it, other than the tempo and the overwhelming brooding intensity. Every song on this tremendous album contains a cinematic musical texture and an anthemic soaring spaciness that almost defies description. It is a great album by someone who is totally unique and whose music has a mellifluous power that ebbs and flows on a tide of extraordinarily beauty that at the same times has a dramatic intensity. At times reminiscent of Neil Young, yes, but an artist who like Young, is totally unique.